gave them power and authority: The verb “to give” (Greek didōmi) stands in the past (aorist) tense, pointing to a single act of granting authority, that is, to the ordination of the Twelve under the hands of Jesus himself. The Greek nouns are dynamis and exousia, common terms in Luke’s record to describe divine power and authority (see the Notes on 1:35; 4:6, 14, 36; the Analysis on 4:1–13). Importantly, the Joseph Smith Translation points to events noted in 8:1 as the occasion for featuring the ordination of the Twelve, and possibly others. To what are they ordained on that earlier occasion? Evidently, to the Melchizedek Priesthood. In this latter instance, which is underlined in our current verse, they receive the full authority of the Apostleship (see the Notes on 8:1 and 9:2). Hence, they apparently receive priesthood authority in steps. Their newly received authority is underscored by their complaint about others exercising priesthood powers (see the Notes on 9:49–50). over all devils: Properly, “over all demons.” The power to control those of the demonic world, and “to cure diseases,” form the proof that these men carry Jesus’ authority and commission as his proper representatives, much as Moses’ rod, as well as his ability to make his hand leprous and to turn water to blood, stands as proofs of his authorization from Jehovah in the eyes of the Hebrew slaves and in the view of Pharaoh (see Ex. 4:1–9). to cure diseases: Although the language here differs from that in the next verse (“to heal the sick”), the meaning may be the same, unless we see this earlier expression pointing to relieving health challenges that are long-term, such as those inherent in “raising the dead, causing the lame to walk, the blind to receive their sight, and the deaf to hear” (Mosiah 3:5). 9:2 he sent them: The verb (Greek apostellō) is the same that underlies the noun “apostle,” plainly drawing attention to this moment as the formal commissioning of the Twelve, much as the same verb denotes the sending of Moses as God’s authorized emissary (see LXX Ex. 3:10). Luke omits the words “by two and two” (Mark 6:7). Verse 9:1 draws attention to Jesus empowering the Twelve and to his conferral of authority; this expression, “he sent them,” points to his specific instruction about what they are to do as his emissaries, to preach and to heal. to preach the kingdom of God: The Twelve’s first assignment is to preach. This preaching embraces a certain message, that about the kingdom, not about private or political interests. Moreover, in the New Testament, the verb “to preach” (Greek kēryssō), and its associated nouns (kēryx, “herald,” and kērygma, “proclamation”), tie particularly to the message about the kingdom of God and about Jesus himself. Out of their first commissioning, the Twelve carry a message that does not yet hold the full story of Jesus and his atoning actions. That part of their preaching will come later. As noted elsewhere, the expression “kingdom of God” is characteristic of Luke’s Gospel (see the Note on 6:20). Modern Apostles carry an added assignment “to prune [the Savior’s] vineyard for the last time” (D&C 95:4). to heal the sick: Some of the earliest manuscripts omit “the sick,” hinting that these words are added later to Luke’s text. But the appearance of the same verb “to heal” (Greek iaomai) with an object in 9:11, describing Jesus’ actions, suggests their originality since, in their mission, the Twelve will imitate the Savior. 9:3 Take nothing: Jesus’ command not to take any means of support throw the Twelve upon the mercies of God and generosity of other people. One surmises that it is a hard but necessary lesson for these men who otherwise enjoy support from families and acquaintances. The one item missing from the list here is shoes (see 22:35; Matt. 10:10). Early Latter-day Saint missionaries receive similar instructions (see D&C 24:18; 84:77–84, 86; compare Alma 17:7). nor scrip: The term (Greek pēra) can mean a traveler’s bag, but may here refer to a beggar’s bag. The latter meaning may be untenable in light of 22:35–36 because Jesus does not want the Twelve to beg for their sustenance (see 10:4; the Note on 22:35). 9:4 there abide: In a general sense, it seems that Jesus wants disciples to remain in the home that receives them rather than looking for a better place to stay. The Joseph Smith Translation strengthens this impression by adding to these words, “there abide until ye depart” (JST 9:4). 9:5 when ye go out of that city: This instruction points to privacy when performing the act that follows, away from the sight and hearing of others (see Matt. 10:14). Such direction can be found in modern instructions to missionaries: “He that receiveth you not, go away from him alone by yourselves, and cleanse your feet even with water . . . and bear testimony of it unto your Father which is in heaven” (D&C 84:92; also D&C 60:15; 109:39–42). In the case of the seventy disciples, who are to preach among Gentiles, the instruction differs: “go your ways out into the streets” (10:10; see the Note thereon). shake off the very dust from your feet: This action evidently goes back to a Jewish custom of shaking dust from one’s feet as one departs gentile territory and enters one’s own, thus leaving behind that which defiles (see the Note on 23:26). This act by the Twelve may envision that those Jews who reject them and their message possess the same defiling properties (see Acts 13:51). for a testimony against them: In these words lies the core of Jesus’ grim attention toward those who reject the message about the kingdom—their rejection will not go unremembered (see D&C 99:4). Such an act will carry consequences in the final judgment: “it shall be more tolerable in that day for Sodom” (10:12); and “it shall be more tolerable for the heathen in the day of judgment, than for that house” (D&C 75:22). Moreover, the outcomes may occur in this world: “Wo, I say again, unto that house, or that village or city that rejecteth you, or your words . . . For I, the Almighty, have laid my hands upon the nations, to scourge them for their wickedness” (D&C 84:95–96; also D&C 99:5). Significantly, this last declaration holds one polished key: punishment—its timing and intensity—belongs to God. The acts of his emissaries stand merely as “a testimony”; they do not bind him to a fixed course of action. 9:6 they departed: The sense is that the Twelve leave immediately, not returning home even for essentials. This response contrasts sharply with those noted later (see 9:59–62). It thus becomes clear why Jesus chooses these men to serve with him. preaching the gospel, and healing: We observe two points. (1) The Twelve, now empowered by Jesus, take up his work by imitating exactly what they have so far seen him do. (2) The two dimensions of their mission, preaching and healing, go together. One does not occur without the other, for miraculous powers validate the right or authority to preach, as Jesus affirms elsewhere either by word or deed (see 5:1–9, 17–25; also 1 Cor. 2:4–5; Gal. 3:5; 1 Thes. 1:5; etc.). every where: As with Jesus, the power and authority which the Twelve carry from him are not restricted by location, as we see in the account of the healing of the demoniac in gentile territory (see 8:26–39; the Note on 8:26). Limitations will arise only because of an unwillingness to accept Jesus and his message (see 10:13–15; Morm. 9:18–21; Ether 12:12; Moro. 7:37). These verses embrace the Savior’s commissioning of the Twelve, one of the vital moments for the church organization that he establishes. In effect, he entrusts his ministry into their hands, broadening the impact of what he alone can exert. To date, they have spent months at his side observing every gesture, hearing every word, and absorbing every lesson. Now the time arrives for them to imitate what they see and learn from their own experiences. At the heart of their preaching, assumed but unrecorded by Luke, rests their testimony of Jesus and his message. They already know much about him, and can testify to others about what they know. From other sources, we learn that he asks them to follow precisely what they have seen him do (see 3 Ne. 18:6, 13, 16, 24; 27:21). Luke alone writes that Jesus generously confers both “power and authority” on the Twelve. For their part, Matthew and Mark record only that he confers authority on them (Greek exousia) although the King James translators render these expressions “gave them power” (Matt. 10:1; Mark 6:7). Luke seems to understand the inner connection between power and authority which will manifest itself in miraculous events that he will report in the later ministry of the Twelve. For the gift inherent in their commissioning for this initial mission will continue with them—it is not a one-time gift to them—and will manifest itself in power at the coming of the Holy Ghost: “ye [the Twelve] shall receive power, after that the Holy Ghost is come upon you” (Acts 1:8). This early experience will prepare the Twelve for their grand, challenging future, a future that will see Jesus intensifying his expectations for them, including extending their ministry to “all nations” (see 22:33–38; 24:47–48). A number of commentators hold the view that the reports of the sending of the Twelve and the sending of the Seventy go back to the same event or same source. But no compelling reason steps forward that sweeps one or the other account from Luke’s Gospel as inauthentic. Although the circumstances of the two missions are similar, the audience of each differs significantly: the Twelve go to fellow Jews (see Matt. 10:6), the Seventy to Gentiles, as the suspension of food laws illustrates (see 10:7–8). Moreover, the response to those who reject them varies markedly: the Twelve are to remove the dust from their feet in private (see 9:5) whereas the Seventy remove it publicly, in “the [cities’] streets” (10:10–11). The differences that matter, it seems, concern those between Luke and Matthew, and Luke and Mark, whose account Luke may be repeating and modifying. The common view is that Matthew and Luke draw information from Mark and from another source, termed “Q” for the German word Quelle, which means “source.” In this view, Luke draws on both accounts to form his story of the sending of the Twelve and the sending of the Seventy. As a caution, one observes that the existence of Q is without proof because no remnants of this hypothesized text have ever been found. In remarkable contrast, one observes that a control of sorts exists by which to test the accuracy of all the reports. This control lies in the Savior’s reminiscences in a modern revelation. In this later revelation, the Risen Jesus speaks of his “friends in days when [he] was with them.” He declares that when he sends them “to preach the gospel in [his] power,” he “suffered them not to have purse or scrip, neither two coats” (D&C 84:77–78). Moreover, in an apparent allusion back to his instructions on that occasion, he declares that “he who feeds you, or clothes you, or gives you money, shall in nowise lose his reward.” In addition, “He that receiveth you not, go away from him alone . . . and cleanse your feet . . . and bear testimony of it unto your Father which is in heaven.” In fact, broadening the audience from individuals to communities, he instructs that “in whatsoever village or city ye enter, do likewise” (D&C 84:90, 92–93). In all, it is important to note, God sets the timing and character of rewards and punishments. When we step back into Luke’s account of the sending of the Twelve, we notice items that are different from the reports of Matthew and Mark. For example, Luke records nothing about the results of the mission of the Twelve; Mark does (see Mark 6:12–13). Luke reports nothing about villages or cities that, as a whole, reject the preaching of the Twelve; Matthew and Mark do (see Matt. 10:6, 11–15; Mark 6:9, 11). 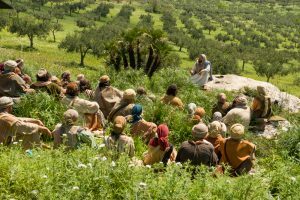 Each of these elements, as we notice, rise in the modern reminiscences from the Risen Savior, underscoring their value for illuminating passages in the Gospels. Further, these reminiscences point up the authenticity of these details in his instructions to his mortal “friends,” the Twelve. In this light, we judge that Luke’s report is lacking in these respects and is therefore to be supplemented by those of Matthew and Mark, as well as by the Savior’s reminiscences, in order to gain a full picture of the instruction to the Twelve. This lack may be due, in part, to the fact that Luke, a second-generation Christian, is gathering information from others’ memories—incomplete in this case—and, in contrast, Mark is effectively reporting the eyewitness reminiscences of Peter. TPJS, 166–67; TDNT, 1:429; Jae R. Ballif, “Powers and Offices in the Melchizedek Priesthood,” in Encyclopedia of Mormonism, 2:882–85. Schürer, History, 2:211–12, n. 42; TDNT, 6:362. Smyth, Greek Grammar, §1856; Blass and Debrunner, Greek Grammar, §318(1). BAGD, 206–7, 277–78; TDNT, 2:299–308, 562–70. BAGD, 740; Marshall, Luke, 352. Plummer, Luke, 239; Morris, Luke, 179. TDNT, 6:629; Marshall, Luke, 354; Fitzmyer, Luke, 1:754; Morris, Luke, 180. Caird, Luke, 144; Marshall, Luke, 349–50; Fitzmyer, Luke, 1:751; against this view stands Plummer, Luke, 270. Marshall, Luke, 349–50; Fitzmyer, Luke, 1:751–52. Brown, “Testimony of Mark,” 61–87; Bauckham, Jesus and the Eyewitnesses, 124–27,155–82.